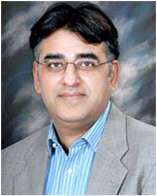 On behalf of the IBA Alumni community, we extend our heartiest felicitations to Mr. Asad Umer, IBA Alumnus, Class of 1983, on being appointed as Minster for Finance, Reforms and Economic Affairs. Mr. Umer has previously served as member of the National Assembly from 2013-18. Before joining politics, Mr. Umer has had a thriving professional career having served as CEO, Engro Polymer and Chemicals and then President and CEO of Engro Corporation. In 2009, he was awarded Sitara-i-Imtiaz for his public service. We wish him all the best on his recent appointment and hope that he will adopt prudent financial management, pursue sound economic policies and serve the nation to the best of his abilities.